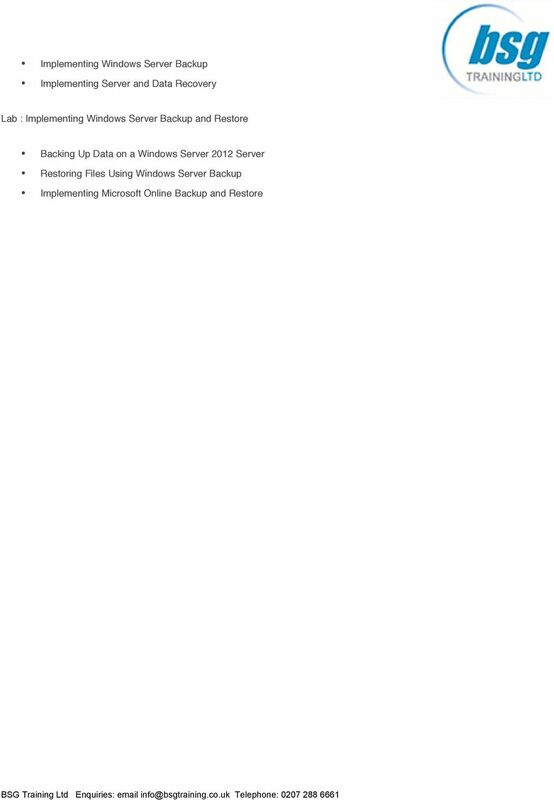 Download "This version of this course is built on the final release version of Windows Server 2012." 1 M20412, Configuring Advanced Windows Server 2012 Services Overview This version of this course is built on the final release version of Windows Server Learn how to provision and configure advanced services using Windows Server 2012 with this five-day course. This course is part three, in a series of three courses that provides the skills and knowledge necessary to implement a core Windows Server 2012 infrastructure in an existing enterprise environment. The three courses will collectively cover implementing, managing, maintaining and provisioning services and infrastructure in a Windows Server 2012 environment. Although there is some cross-over of skills and tasks across these three courses, this course primarily covers advanced configuration of services necessary to deploy, manage and maintain a Windows Server 2012 infrastructure, such as advanced networking services, Active Directory Domain Services (AD DS), identity management, rights management, Federated services, network load balancing, failover clustering, business continuity and disaster recovery. This course maps directly to and is preparation material for Microsoft Certified Solutions Associate (MCSA):Windows Server 2012 exam '70-412: Configuring Advanced Windows Server 2012 Services'. Audience Profile This course is intended for IT professionals with hands-on experience implementing, managing, and maintaining a Windows Server 2012 infrastructure in an existing enterprise environment, who wish to acquire the skills and knowledge necessary to perform advanced management and provisioning of services within that Windows Server 2012 environment. Suitable candidates are typically experienced system administrators who have real-world experience working in a Windows Server 2008, Windows server 2008 R2 or Windows Server 2012 environment. 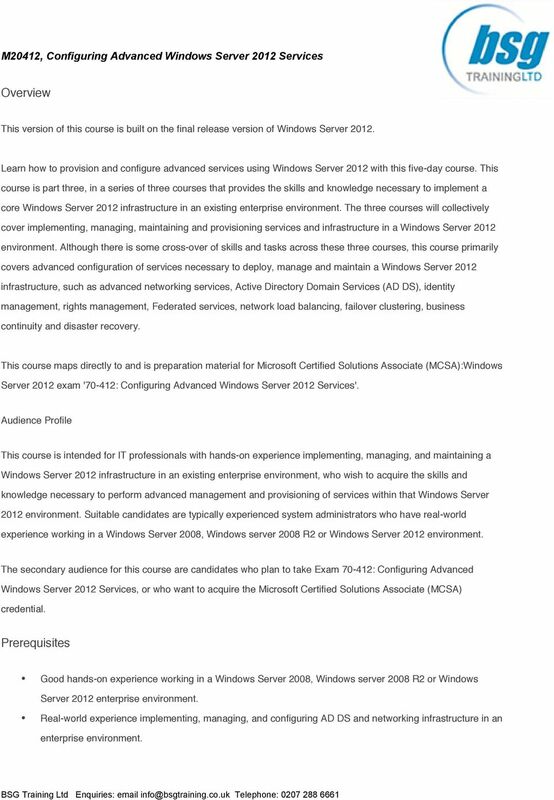 The secondary audience for this course are candidates who plan to take Exam : Configuring Advanced Windows Server 2012 Services, or who want to acquire the Microsoft Certified Solutions Associate (MCSA) credential. Prerequisites Good hands-on experience working in a Windows Server 2008, Windows server 2008 R2 or Windows Server 2012 enterprise environment. Real-world experience implementing, managing, and configuring AD DS and networking infrastructure in an enterprise environment. 2 Delegates will learn how to Implement advanced network services. Implement advanced file services. 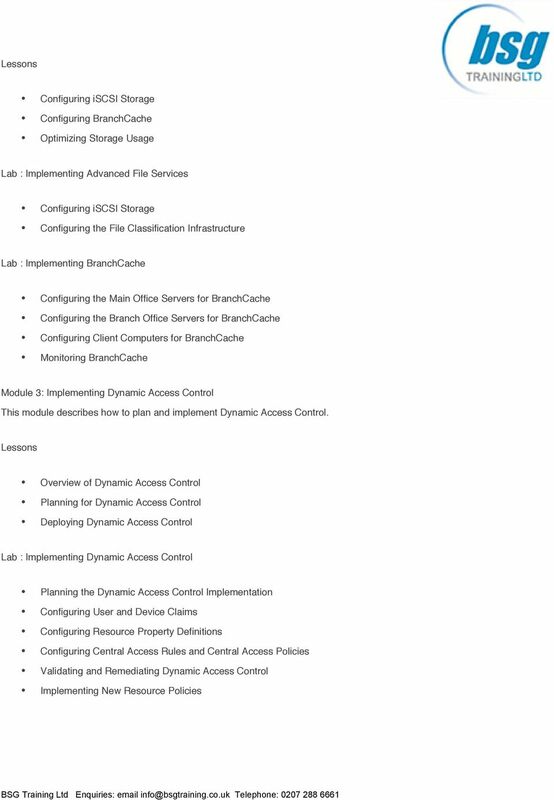 Implement Dynamic Access Control. Implement distributed Active Directory Domain Services (AD DS) deployments. Implement AD DS sites and replication. Implement Active Directory Certification Services (AD CS). Implement Active Directory Rights Management Services (AD RMS). Implement Active Directory Federation Services (AD FS). 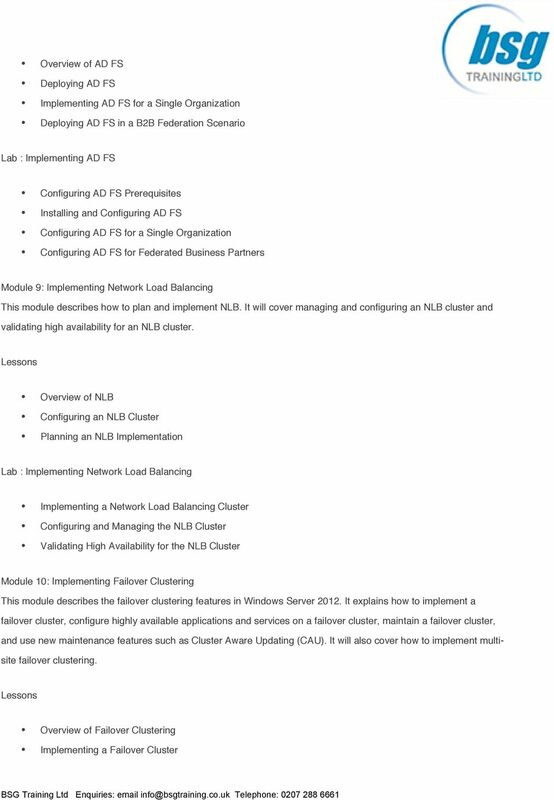 Implement network load balancing (NLB). Implement failover clustering. 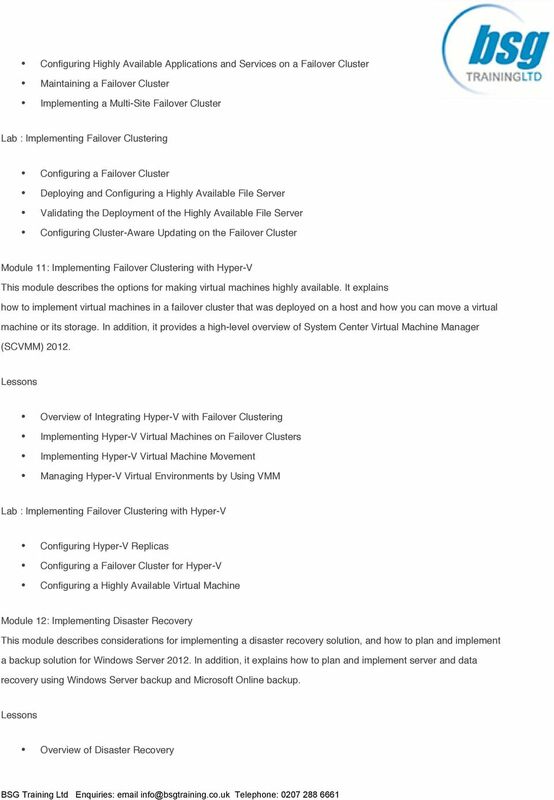 Implement failover clustering with Hyper-V. Implement disaster recovery. Course Outline. Module 1: Implementing Advanced Network Services This module describes how to configure advanced features in the Domain Name System (DNS) and Dynamic Host Configuration Protocol (DHCP) with Windows Server 2012, and it covers IP Address Management (IPAM). 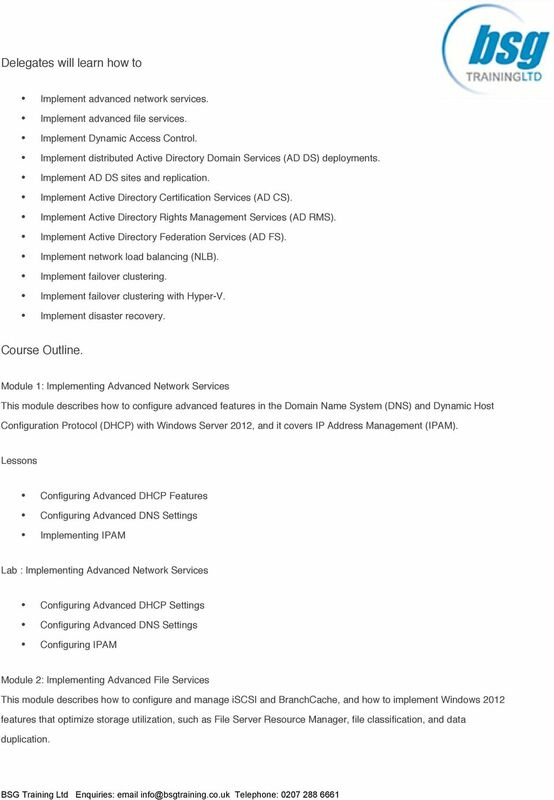 Configuring Advanced DHCP Features Configuring Advanced DNS Settings Implementing IPAM Lab : Implementing Advanced Network Services Configuring Advanced DHCP Settings Configuring Advanced DNS Settings Configuring IPAM Module 2: Implementing Advanced File Services This module describes how to configure and manage iscsi and BranchCache, and how to implement Windows 2012 features that optimize storage utilization, such as File Server Resource Manager, file classification, and data duplication. 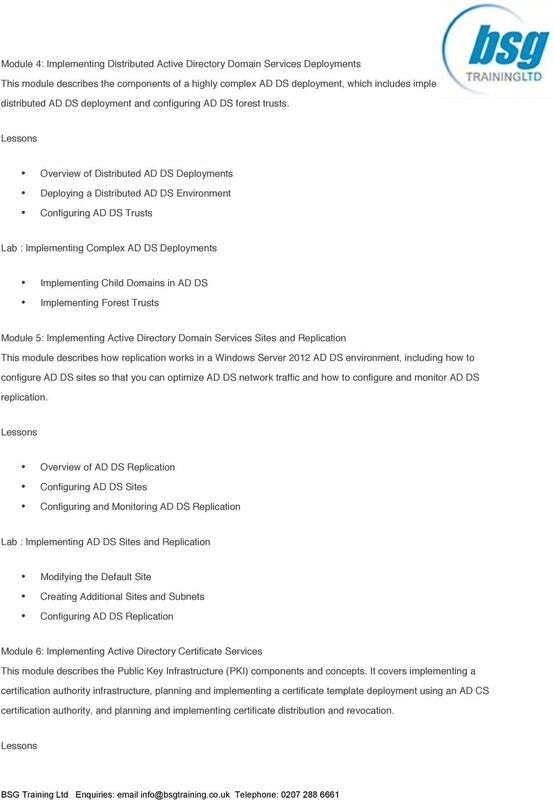 4 Module 4: Implementing Distributed Active Directory Domain Services Deployments This module describes the components of a highly complex AD DS deployment, which includes implementing a distributed AD DS deployment and configuring AD DS forest trusts. Overview of Distributed AD DS Deployments Deploying a Distributed AD DS Environment Configuring AD DS Trusts Lab : Implementing Complex AD DS Deployments Implementing Child Domains in AD DS Implementing Forest Trusts Module 5: Implementing Active Directory Domain Services Sites and Replication This module describes how replication works in a Windows Server 2012 AD DS environment, including how to configure AD DS sites so that you can optimize AD DS network traffic and how to configure and monitor AD DS replication. Overview of AD DS Replication Configuring AD DS Sites Configuring and Monitoring AD DS Replication Lab : Implementing AD DS Sites and Replication Modifying the Default Site Creating Additional Sites and Subnets Configuring AD DS Replication Module 6: Implementing Active Directory Certificate Services This module describes the Public Key Infrastructure (PKI) components and concepts. It covers implementing a certification authority infrastructure, planning and implementing a certificate template deployment using an AD CS certification authority, and planning and implementing certificate distribution and revocation. 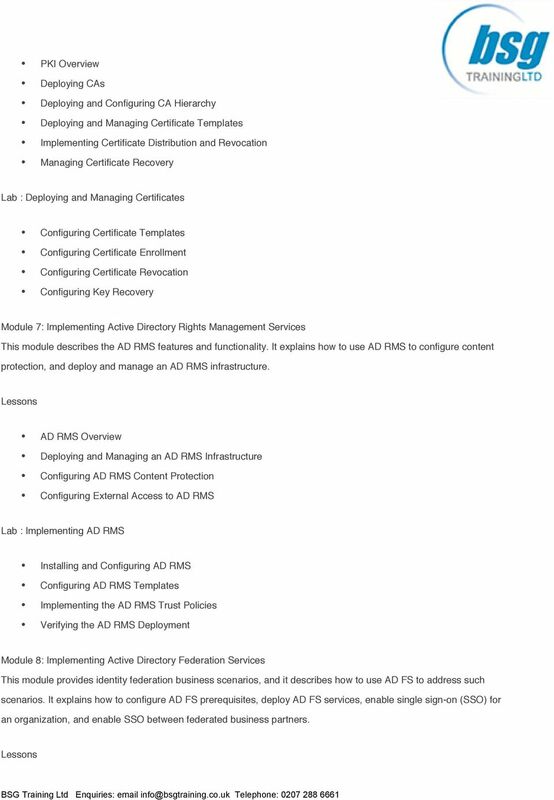 5 PKI Overview Deploying CAs Deploying and Configuring CA Hierarchy Deploying and Managing Certificate Templates Implementing Certificate Distribution and Revocation Managing Certificate Recovery Lab : Deploying and Managing Certificates Configuring Certificate Templates Configuring Certificate Enrollment Configuring Certificate Revocation Configuring Key Recovery Module 7: Implementing Active Directory Rights Management Services This module describes the AD RMS features and functionality. It explains how to use AD RMS to configure content protection, and deploy and manage an AD RMS infrastructure. AD RMS Overview Deploying and Managing an AD RMS Infrastructure Configuring AD RMS Content Protection Configuring External Access to AD RMS Lab : Implementing AD RMS Installing and Configuring AD RMS Configuring AD RMS Templates Implementing the AD RMS Trust Policies Verifying the AD RMS Deployment Module 8: Implementing Active Directory Federation Services This module provides identity federation business scenarios, and it describes how to use AD FS to address such scenarios. It explains how to configure AD FS prerequisites, deploy AD FS services, enable single sign-on (SSO) for an organization, and enable SSO between federated business partners.